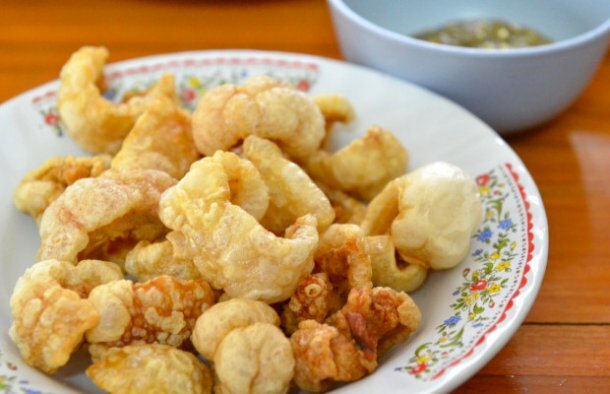 Portuguese Pork Rinds (Torresmos) are a very traditional and popular delicacy in Portugal, they are very rich and flavorful. Cut the pork belly into medium sized 1 inch strips. Wash the pieces well in a bowl of water, drain, and let the pieces dry completely. In a bowl, combine the pork strips with the salt (to taste) and baking soda. Heat a deep heavy saucepan over medium-high heat and add the vegetable oil. Add the pork and let it cook, stirring occasionally, until the fat has separated and the pork skin is lightly golden. Then remove the pork skins with a wire strainer, then drain completely on paper towels, let it cool and put aside. Meanwhile, let the lard remaining in the saucepan cool slightly, but while it is still liquid, strain it through several layers of cheesecloth in a sieve into a large mixing bowl. Place it in saucepan over medium to high heat and cook until hot but not smoking. In batches, return the pork skins to the fat, making sure not to overcrowd the pan. Let the pork skins fry about 3 to 4 minutes or until they become a rich golden color. Remove them with a wire strainer before they darken, and drain as before on a paper towel. Once dried, they can be served immediately, while still warm. They can also be stored for up to 3 days in an airtight container. Please Note: The cooking time may not be accurate, if you do try this recipe, please let me know more or less how long it took, thanks. 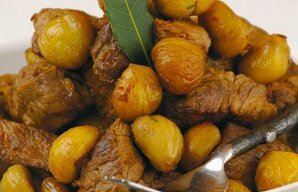 This Portuguese pork with chestnuts recipe (receita de carne de porco com castanhas) is delicious. 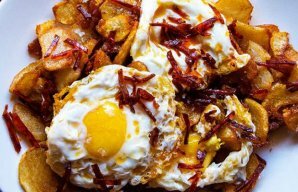 How to make Portuguese fried eggs with chouriço and fries. 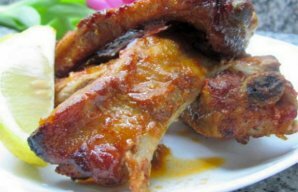 Serve these amazing Marinated Portuguese roasted pork ribs (costeletas de porco assadas) with some rice and a good wine.